TREX Film Plastic Recycling Challenge begins November 15! Last year 21 Clark County schools participated in the TREX Challenge and collected nearly 12,000 pounds of plastic bags, film and wrap! Can you even fathom how much plastic it would take to add up to that? We were overwhelmed by the participation rate by our Clark County schools. What: Schools who enroll in the TREX Challenge ask their students to bring in plastic bags and other plastic wrap. Their school representative weighs the material, reports the weight online to TREX and then takes the it to the grocery store to get recycled. TREX recycles the material and makes it into composite lumber. Why: Each year millions of plastic bags go in landfill. Some also end up in the blue curbside recycling carts which clogs the recycling sort machines. Alternatively, these could be turned into something new and we’d love your help in educating students that plastic bags and wrap can be recycled. How: Go online and sign up today! First place winner will receive a TREX bench! How do our campus operations and daily choices affect the environment? 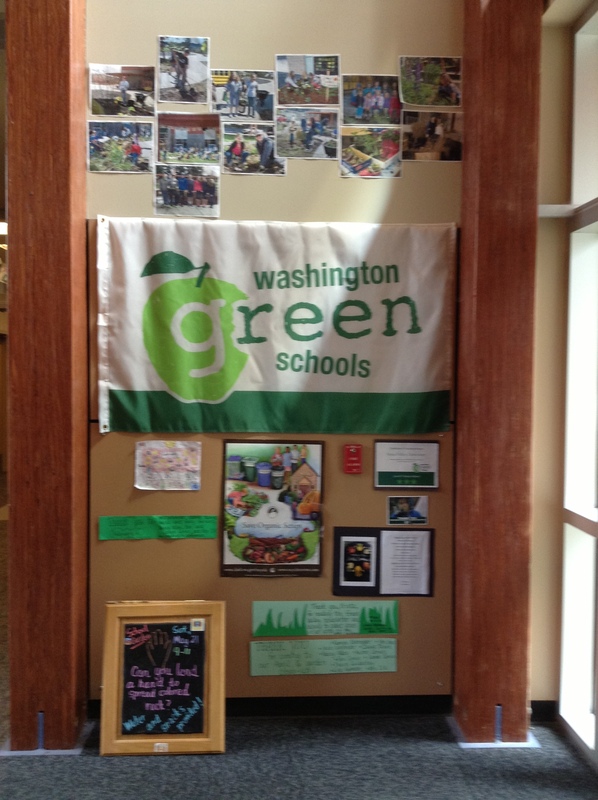 Washington Green Schools is a voluntary, web-based program your school can use to reduce its environmental and carbon footprint. This program provides resources and tools to involve your school community in assessing the current status of your campus and taking action. Vancouver, WA – Students and teachers from more than 30 Clark County schools will gather next week to learn how to increase their environmental leadership in their schools. 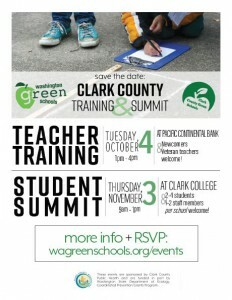 Clark County Green Schools will host its annual Student Summit from 9 a.m. to 1 p.m. Thursday, Nov. 3, at Clark College’s Gaiser Hall, 1933 Fort Vancouver Way. The four-hour event will include educational activities, breakout sessions and opportunities for students and teachers to learn from one another. 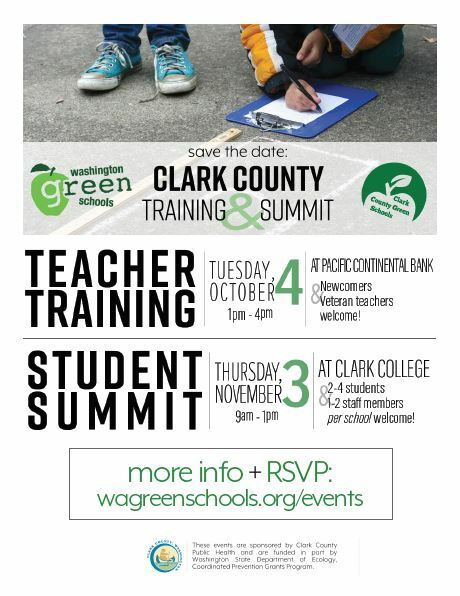 The Green Schools Summit is a collaboration between Clark County Public Health and Washington Green Schools, a statewide nonprofit that helps create more sustainable school communities. Schools in the program can certify as a green school in these environmental categories: water, waste and recycling, school grounds and gardens, energy, healthy school buildings and transportation. The Clark County Green Schools program strives to create a cohesive system of environmentally active schools where students, teachers and parents promote sustainable living and earth friendly practices. In Clark County, 83 schools participate in the Washington Green Schools program, the greatest number in any county in the state. In the 2015-16 school year, 29 Clark County schools earned one or more environmental certifications. To learn more about the Clark County Green Schools program and how your school can participate, visit www.clark.wa.gov/public-health/clark-county-green-schools. 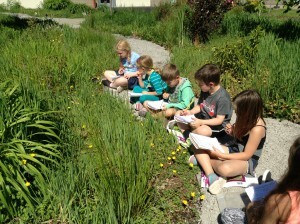 Purpose of Grant: Promote knowledge and encourage responsible stewardship of the environment among district students. Innovative projects involving gardening, horticulture, agronomy, entomology, environmental sciences, life sciences and earth sciences will be considered. Project goals will be defined and measurable. How to Apply: Complete the Grant Request Form in this packet or download one from the CGCofCW web site at GardenClubOfCamasWashougal.org under the “Grants” tab. Submit the request form as indicated so it is received by October 20, 2016.
Who Can Apply: All teachers and staff in the Camas and Washougal school districts from Pre-K through 12th grades. Notification of Awards: Award winners will be notified by November 21, 2016. Need help: The CGCofCW will work with applicants to answer questions. Please contact us via email at CGCofCW_Philanthropy@yahoo.com. Congratulations-Grass Valley is now certified in School Grounds & Gardens through the Washington State Green School Program. Students working on environmental science, Grass Valley first graders observe and sketch diverse plants in their science notebooks. They use recycled empty bird seed bags for mats and got to try out the new gravel path! 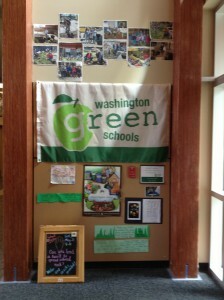 Grass Valley teacher, Julie Della Valle, has created a WA Green School corner in the main entrance area of the school. 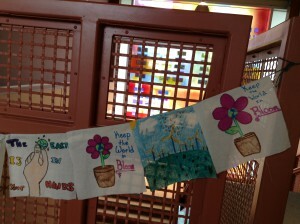 There on display is news and thanks for all the volunteers who work in the school garden. Posted you will find the next garden clean-up dates and information on the plants throughout the garden space. 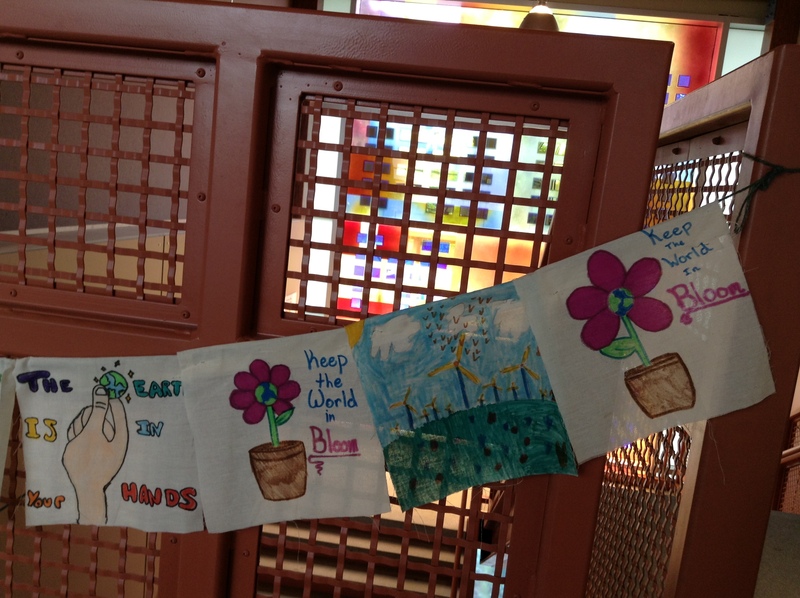 Earth Day flags are a Grass Valley Earth Day tradition, every student creates an environmental message with his/her teacher’s support and we string inside and outside for all to see. It’s Fun! – Earth Day is a great time to plan fun, educational, and action-oriented activities. Celebrating Earth Day on or around April 22 can be a great way for schools to showcase classroom environmental education, highlight efforts to “green” the school facility, or engage the whole school community in making a difference. a great way to honor the Earth: do math or spelling with chalk out on the blacktop. THEME: What is a Watershed? ELIGIBILITY: The contest is open to all student artists in grades 3-12. Entries must be the original work of the student. DEADLINE: Entries must be received by 5 p.m. on Friday, April 1st, 2016. Recycled Materials: Sculpture, mixed media, or recycled fashion created from at least 80% recycled or reused materials that would otherwise be thrown away or recycled. Fashion pieces must be durable enough to wear in public. Entries will be judged on percentage of recycled material, creative use of materials, and connection to theme. Written Word: Written word pieces must be reflections on the watershed you live or go to school in and must be in the form of a short story or poem. Length of piece must be 500 words or less. Entries will be judged on interpretation of theme, creativity, and writing style. HOW TO SUBMIT: Entries may be mailed, e-mailed or delivered to the StreamTeam office. Please include your name, age category, school, and watershed with your entry. Written word entries can be submitted electronically via email to EnviroEd@clarkpud.com. Please include “Watershed Reflections” in subject line. Commerce received a $25,000,000 appropriation in the 2015-2017 state Capital budget to continue the Energy Efficiency and Solar Grants program. Our program focuses on funding the best energy efficiency and solar projects possible. The Energy Efficiency and Solar Grants program stimulates Washington’s economy by creating jobs and reduces energy and water costs to the state’s public higher education institutions, local government facilities, state agencies, and K-12 public school districts. The program also promotes the use of Washington-manufactured solar products, including solar modules and inverters. 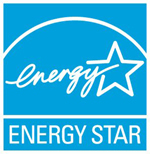 All Camas Schools are members of the District’s Energy Star family and have earned the U.S. Environmental Protection Agency’s (EPA’s) ENERGY STAR certification, which signifies that the building performs in the top 25 percent of similar facilities nationwide for energy efficiency and meets strict energy efficiency performance levels set by the EPA. Grass Valley Elementary: This school was certified at Level 3 in school grounds. The Green Team worked to breathe new life into neglected areas of the campus and organized weeding parties to help keep areas free of invasive species. It also planned a composting center for leaves, other vegetation and kitchen scraps. Skyridge Middle School: This school was certified at Level 3 in Waste & Recycling, Transportation, and Healthy School Buildings. The Green Team began an educational campaign and replaced all of their antibacterial spray with an all-natural, environmentally responsible alternative. The Green Team also continues to maintain the changes that they have achieved in past certifications through the implementation of recycling programs, no-idling zones, and student-led efforts to lessen Skyridge’s environmental footprint. Thanks to their efforts, Skyridge is now a healthier, more sustainable place!